the 2016 Pages UnBound Festival. Workshop in 2015. COSTUMES, PROPS AND MORE . . . . 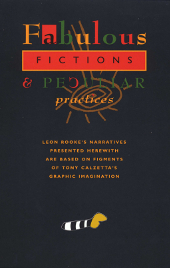 Looking through the images, and the texts, attached to the PressWerk limited edition of Fabulous Fictions, it is obvious that there are visual themes which could easily be exploited in a theatrical workshop presentation. The banker, for example, who delivers the "Bank President's Address to Minions on the Eve of the Release of the Annual Financial Report Showing Profits Heretofore Unseen in the World" should wear a starched white shirt, possibly even a Victorian starched white shirt, red suspenders and a red bow tie. Perhaps formal black dress pants with grey pinstripes. The unintended allusion to an undertaker may not be inappropriate. The bow tie may be pushing the metaphor; David Ferry will have thoughts on the subject. David Carruthers at St Armand Paper in Montreal might be able to supply bags of shredded money we could use as confetti? Tony Calzetta suggests the shirt could have bank notes printed all over it. 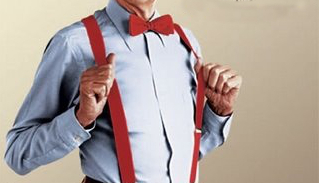 Banker's red suspenders and bow tie. The Bank Pillars could be made from twelve-foot lengths of black PVC sewer pipe, though Tony suggests that construction sono tube forms would be lighter and cheaper than PVC, and easier to manipulate. The waves in the background could be animated and projected on a scrim. The waves could also be jigsawed out of plywood and attached to a 4-wheel plastic office dolly so they could roll across the stage. Global Industries offers a plastic dolly (24" x 16" with a deck just 4.5" off the ground) for $33.95. The Scots Women in Peculiar Practices should wear tartan, and presumably dance a Highland Fling? Tony likes this idea, particularly if the kilts are worn in the traditional way. There's a mediaeval oversized curtain rod with tapestry that makes an appearance in "Cezanne's Muse, Part Two and then reappears almost immediately in "Ravening Beasts at Fairy Godfather House". An echo of the theme occurs in Peculiar Practices in "Some Ideas About the Camping Experience". The tapestry should open, and close, from either side, and the material should be heavy, appropriate to a mediaeval castle. Sometimes the tapestry could be draped to one side, as it appears in Tony's images. Fairy Godfather House is a castle with turrets, that may be the size of a doll house? Or maybe the castle itself is a doll house, and we also, simultaneously, project onto a scrim images of Neuschwanstein Castle in Bavaria which was the model Walt Disney used for the castle in Sleeping Beauty. There'a huge black kettle, maybe a cauldron, in Sullenness of Machines. I have seen such a thing used in the maple syrup industry, but the cost (and weight) of such an object may be prohibitive. A witch's cauldron, on the other hand, might offer a nice counterpoint to fairy tale images of Neuschwanstein Castle. The Lousy Pessimists in Peculiar Practices probably need an industrial-sized floor-mounted fan with streamers. Google suggests that a 30" CD Industrial Pedestal Fan (non-oscillating) could maybe be acquired for something like $175. The steamers will help to make it obvious that the fan is working. There's a rocket ship, in the "Daughter of Son of Scroll". Tony suggests this could be an inflatable, with wind-blown streamers coming out the back. Rocket ship from "Daughter of Son of Scroll". "Peculiar Practices in Alberta Possibly Related to the Oil Boom" offers the chance to project images of oil donkeys, and oil derricks. These are likely projected onto a scrim. We've also got a Scroll of Civilization, and I'm not sure what that looks like? Though Ball Media in Brantford offers a 33.5" retractable banner stand for $220 (on sale). Beyond the obvious props, there are also a number of opportunities for mechanizing various devices. There's a hand, introduced in "Lousy Pessimists", that appears again in "Narcissistic Eb". This looks like a Michael Jackson white gloved hand, but it should wave, mechanically, like the Queen waves. A gloved hand on a stick doesn't sound appealing. A better idea may be to try to mechanize the hand, perhaps with used bicycle parts? Brian Travis at Erin Forks bicycle shop may be able to help. Or Brian suggests Gilbert Vanden Heuvel of Goderich who is a welder who makes sculptures out of bicycle parts. Waving hand from "Narcissistic Eb". One of the most intriguing props is the boat featured in "Snoop" which has a Don Quixote-style windmill propeller. Concept for Snoop's skiff from "Snoop, Protégé of Snap". The prop will include a moving propeller and blinking red dots. Tony is particularly enchanted with the idea of rubber inflatables such as the Rolling Stones used on the Voodoo Lounge Tour in 1994-95. So far we have determined that Landmark Creations in Minnesota specializes in custom designed rubber inflatables, which could cost $500 to $25,000. The bumblebee striped manicule from "God Talks" would be one obvious image that could be made inflatable. Landmark Creations also offers some stock designs for inflatable clouds that look attractive. 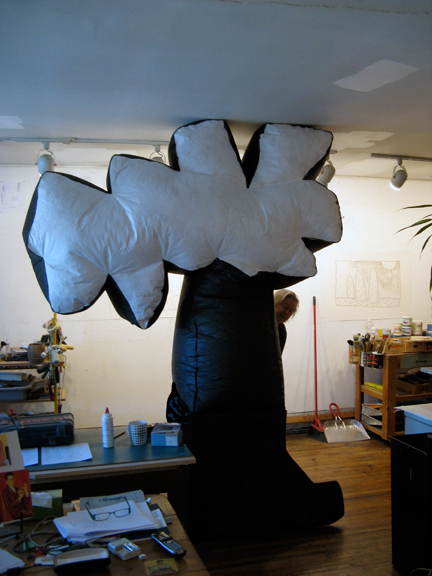 Inflatable designed by Tony Calzetta and built by artist Max Streicher. Tony holds a propeller, which will rotate slowly with help from a small motor. These will be used to bring to life Snoop's skiff from "Snoop, Protégé of Snap". The Porcupine's Quill has a set of three mahogany doors that are hinged to fold flat, or to open to a "W" shape without the final upturn leg. The doors are two-sided (obviously) so the idea would be for Tony to paint a triptych on one set of three panels to represent Fabulous Fictions; then a matching triptych on the other side for Peculiar Practices. The doors are heavy, and self-standing. Each panel is 30" wide x 80" high. Any number of these props could also be used to animate a gallery presentation of Fabulous Fictions, that could (possibly) open at the De Luca gallery on Avenue Road. Then Snoop's boat appears with the windmill propeller turning; the boat contains three cast members in painted tight body costumes each painted differently similar to the original drawing, backs to the audience, inanimate and coming to life only after the ship arrives and stops on stage. 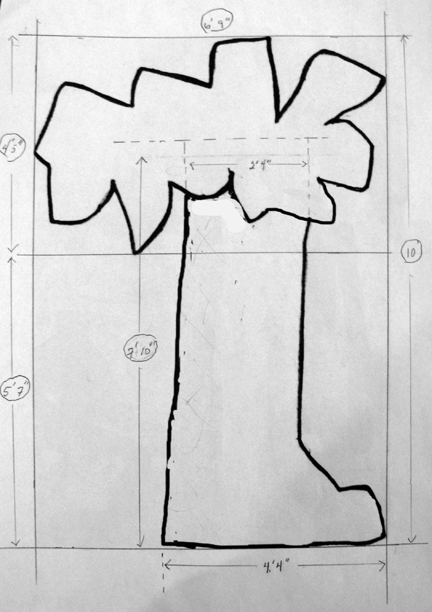 Tony Calzetta's sketch and dimensions for building a prop for the production. 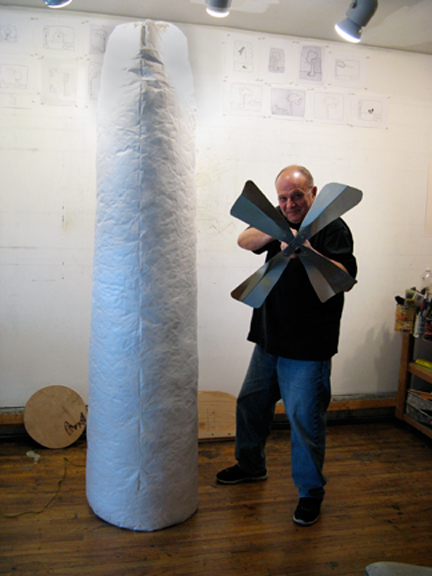 Finished inflatable prop built by Max Streicher to Tony's specifications. Invite theatre school students to participate and/or observe the workshop. Contributions might include acting onstage, providing musical or dancing skills, or assisting with behind-the-scenes support. Involve a musician or composer in the workshop. Public participation may include a volunteer auction to recruit readers, or an onstage “test” during the workshop. Leon and David, who work on voices with participants. Since the workshop is meant to act as a precursor to a larger performance down the road, it should reflect the artist&apos;s process of making quick sketches before tackling a larger work, or a poet creating a physical voice for his written words. In keeping, props such as inflatables might slowly inflate during workshop performances—whether mechanically, through a compressor with multiple leader hoses, or as a series of bicycle pumps stationed around the space and manned by volunteers.